Alain Resnais and Chris Marker, Les Statues Meurent Aussi, 1953. Film still. Later in this sequence, in a visual repertory of still images of masks, Greek, Japanese, Sumerian, Roman, and Modern reminiscences are ascribed to some, while others are described as “ beast’s masks, man’s mask, house-mask, face-mask, Pierrot of the rivers, Harlequin of the forest” in a cultural comparativist hodge-podge with a universalist bent that never fails to return to a Eurocentric perspective. In another sequence devoted to masks – the film’s last – masks are shown tightly hung in museum storage, possibly that of the British Museum, Musée du Congo Belge (present-day Musée de Tervuren), or Musée de l’ Homme (present-day Musée du Quai Branly after the fusion of the collections from the now defunct Musée des Arts d’ Afrique et d’ Océanie), offering one last indictment of the nefarious role played by Western museums in the death of African art. Taking its cues from Statues Also Die, Masks Also Move shows how the paradoxical image of African art assembled in the sixty-year-old, thirty-minute long cinematographic collage is as dated as it is current, and how the stereotypes that Statues Also Die exposes and reinforces continue to find currency among Western and African conceptions of art. In a twenty-first century, tongue-in-cheek reversal of the movie’s title and radical rebuttal of notions of traditional African art as essentially sculptural, Masks Also Move looks at contemporary African art practices that put masks back into motion. In doing so, Masks Also Move seeks to delineate genealogies of African performance as alternatives to performance art’s mainstream narrative and to expose performance art’s own Eurocentric primitivist myth of origin in the process. “ Not all African peoples are sculptors,” says Beninese art historian and Dahomey appliqué cloth specialist Joseph Adandé, refuting a belief he said was inherited from Cubism.4 In the same vein – that of the refutation of the idea of the invention of African art by Western modernism – I would argue that not all performance art was born of the European avant-gardes of the early twentieth century. Further, I highlight here the paradox of a Eurocentric conception of performance art premised upon artistic movements indebted to the so-called “ primitive” arts, chief among which was African art, while simultaneously doing away with the notion of contemporary African performance art in ways that, possibly, preclude its very emergence. 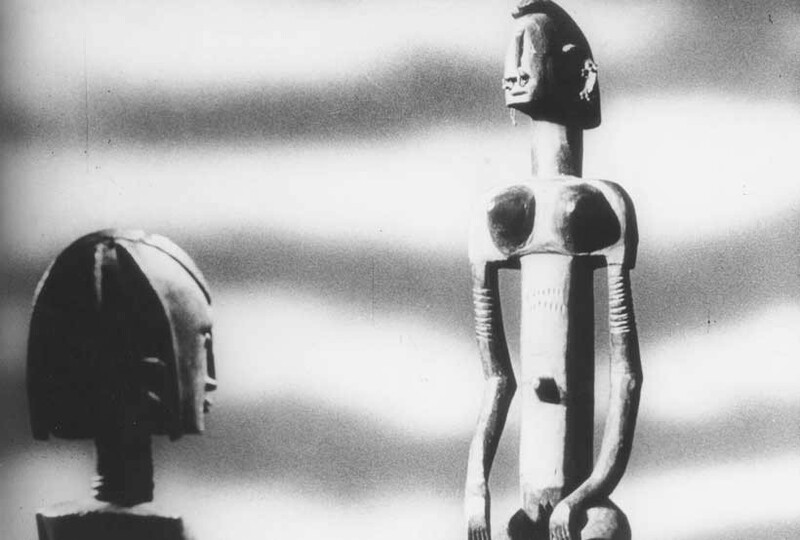 Did the double process by which African art was recuperated as primitivism by the historic European avant-garde and evacuated as fetishism by the colonial missionary enterprise fill a gap in European art practices while also creating a void in the development of modern and contemporary African art practices? Did emancipation from stereotypes linked to the performance of the black body –long conceived of as primitive by colonial ideology, often caricatured, and at times entirely banned – allow for a re-appropriation of performance by African artists leading to the current emergence of performance in contemporary African art? If twentieth-century primitivism participated in a colonial vision of Africa and its cultural productions, then known as modern, multiculturalism renewed a well-meaning interest in diversity while globalization normalized the idea of the Other and postcolonialism theorized strategies of resistance. Where, then, does performance stand in contemporary African art practice in our current moment when performance art dominates the discourse of contemporary art? Only recently have debates about contemporary African performance art per seemerged. This notably includes Performa, the visual arts performance biennial whose founder RoseLee Goldberg is the very art historian who pioneered a history of performance art rooted in Futurism, Dada, and Surrealism.4 That the book is largely concerned with the history of European and North American performance art – hence its roots in the aforementioned European avant-gardes – is never stated as such in the title of the original book, Performance Art: From Futurism to the Present, which implies universalism where there is in fact Eurocentrism. With few examples outside the Euro-American context (although performances by African-American, Latin-American, and Asian-American artists are mentioned), Goldberg’s update to the book (Performance: Live Art Since the 60s,) fails to show fully how “ the chosen medium for articulating ‘ difference,’ whether dealing with issues of identity, multiculturalism or globalism” 5 is not first and foremost a tool of Western othering rather than an instrument for non-Western self-representation. In 2010, Performa organized “ Contemporary Performance in Cape Town, Kinshasa and Tunis,” a conversation with Okwui Enwezor and Deborah Willis presented by Goldberg.6 While the event effectively discussed the context surrounding the emergence of performance practices in these cities and emphasized the need for studying their distinct genealogies, Enwezor’s presentation on Samuel Fosso and Willis’s on Mary Sibande and Les Sappeurs only began to open up a field of investigation as vast and diverse as the cities and countries that the event sought to highlight. Moreover, they did so without necessarily recognizing that the largely Western definition of performance art, itself the byproduct of the still largely Eurocentric field of art history, vastly hinders this endeavor. So where does performance stand in contemporary African art today among Euro-American, which is not to say Eurocentric, conceptions of both African art and performance art? What is at stake in the reassessment of contemporary African art from the point of view of performance and in the establishment of a genealogy of contemporary African performance art practices today? Meschac Gaba’s braids and wigs, or tressesand perruques, as he calls them in French, were not conceived in Cotonou but in Harlem. The artist (b. 1961 in Cotonou) contends that they have nothing to do with masks nor, he claims, do the défilé de perruques, or “ parade of wigs,” have anything to do with masquerade.9 As sculptural and architectural constructions of braids worn on the head (some of the first wigs represented New York skyscrapers), Gaba’s perruques exemplify the historical, traditional, and contemporary importance of the head and hair in African and African diasporic cultures, whether through hairstyles or other head ornaments. Set into motion by the défilé de perruques, Gaba’s work speaks to the daily flux of contemporary life. 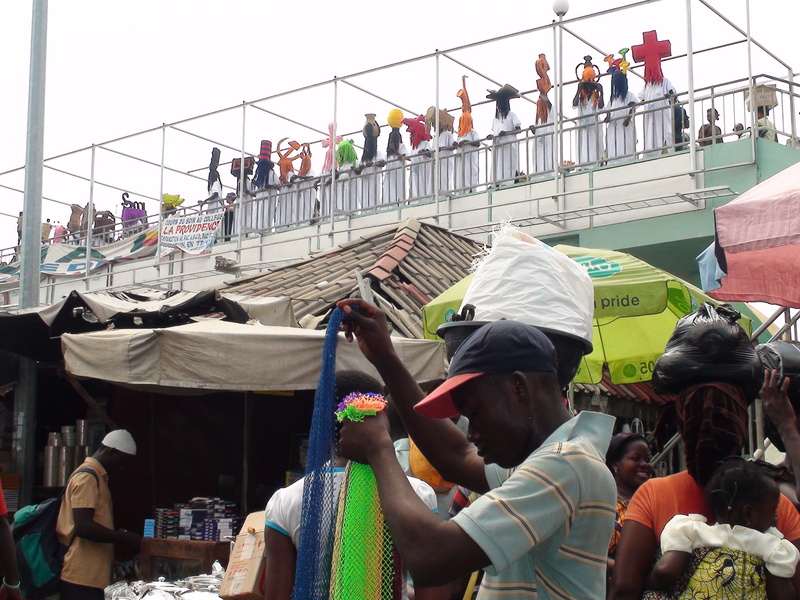 The motivation behind exhibiting the work outdoors was spurred by the artist’s desire to make the project accessible to a wider audience, while the inspiration behind using the processional mode stemmed from the ambulation of the market women of Cotonou selling goods transported on their heads. Throughout the city’s streets and the country’s roads, women balance heavy loads of food produces onto a tray stabilized by rolled-up rags on top of the head. Meschac Gaba, Défilé de Pérruques, Tresses Series, December, 2010. Processional performance during the Musée de l’Art et de la Vie Active (MAVA) opening, Cotonou, Republic of Benin. Courtesy the artist and STEVENSON Cape Town and Johannesburg. © Meschac Gaba. At first, the tresses represented buildings from Cotonou and New York City, where they premiered in 2005 following a residency at the Studio Museum in Harlem. Later, they depicted buildings from London and Paris, where they were first shown in a street procession in 2006 and, subsequently, in Cape Town at Michael Stevenson Gallery. Next came the cars, shown in Cape Town for a second show of Tresses at Michael Stevenson Gallery. As part of the Bibliothèque Résidence of his Musée d’ Art de la Vie Active (MAVA) begun in Cotonou in 2010, Gaba exhibited tresses representing symbols ranging from dollar signs to Coptic and Christian crosses, the Communist Hammer and Sickle, a saxophone, and an open book. 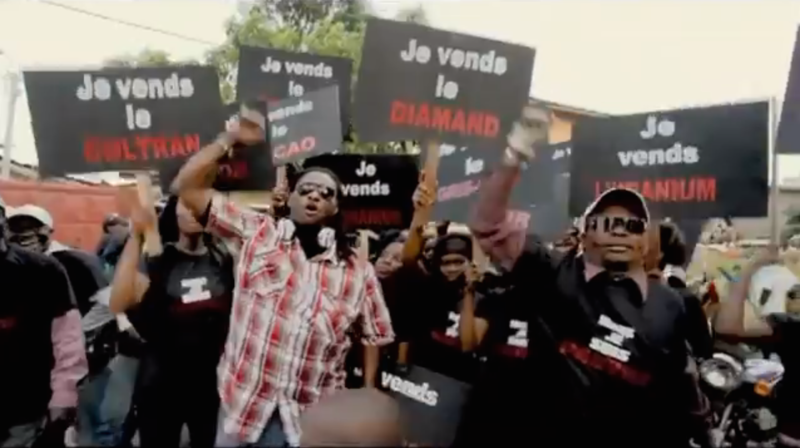 For the opening of Biennale Bénin 2012, Gaba outfitted so-called zemidjans mopeds with signs bearing various messages, forming a mobile library squad. Never mind that the lower part of the tresses or perruques often covers the face of their wearer with braids left dangling, as if a curtain through which to see without being seen, in a manner similar to Egun and other masks. Never mind that the upper part of the tresses or perruques represents functional objects as bearers of a social message in the fashion of Gélédé masks. Never mind that unlike previous outings where the wearers of the tresses wore everyday garb, in their last outing participants dressed in white, costume-like robes that further enhanced the aesthetic qualities of the headpieces as in traditional, fully-fledged, masks. Despite all this, Gaba remains adamant that the tresses are not masks and that their public performances do not amount to masquerades. Meschac Gaba, Musée de l’Art et de la Vie Active: Bibliothèque Roulante, November, 2012. Processional performance at the Biennale Bénin, Cotonou, Republic of Benin. Courtesy the artist and STEVENSON Cape Town and Johannesburg. © Meschac Gaba. Granted, the wearers of the tresses do not seem to channel an extra-humane force or undergo a spiritual transformation as masks do in masquerades. But why such staunch opposition to the very notion of mask and masquerade from a contemporary Beninese artist? Mentioning the recently deceased Tokoudagba, an artist seen as the bearer of the Fon artistic tradition, Gaba explains that he respects tradition but is invested in resolutely contemporary forms and is keen to discuss his work in terms of performance, not masquerade. Contrary to Gaba, Edwige Aplogan (b. 1955 in Porto-Novo) is eager to re-appropriate or, in her words, to rehabilitate, some of Benin’s most iconic masquerades. However, rather than doing so through performance, Aplogan creates public monuments.10 Starting in 2010 as part of the wider project, Drapés de Monuments (Monument Drapings), which was spurred by the fiftieth anniversary of the independence of seventeen African countries, including Benin (the project was originally called Drapés du Cinquentenaire (des Indépendances) or Drapings of the Fiftieth Anniversary (of the Independences)), Aplogan covered public monuments in some of Cotonou and Porto-Novo’s most popular places and populous crossroads. Edwige Aplogan, Egun d’Adjarradoccodji, 2010. Legba statue in plexiglass and string lights, Porto-Novo, Benin Republic. Courtesy the artist. Whether a palm tree in Le drapé de la Place de l’Etoile Rouge (Draping of the Place de l’Etoile Rouge) in Cotonou, unveiled on 1 August 2010, the fiftieth anniversary of Benin’s independence, or the ship-like wrapping of the so-called Fort Ouidah apartment building in Le drapé de l’immeuble de l’ancien président Sourou Migan Apithy (Draping of the Building of Former President Sourou Migan Apithy) in late January 2011, in a Brazilian neighborhood of Porto-Novo that is reminiscent of the history of the slave trade, or the Egun d’Adjarradoccodji (Egun of Adjarradoccodji) around the Adjarra market in Porto-Novo in October 2010, Aplogan’s drapés represent a patchwork of African flags sewn in satin, sustained by a rigid metallic armature, and embellished with garlands illuminated at night for maximum 24/7 impact. Building on these previous works, Aplogan hopes to realize a project that brings together three iconic masks shared by the Beninese and the Nigerians – Egun, Zangbeto, and Gélédé – at the Carrefour Sémé, the last crossroads in Benin on the road to Nigeria. 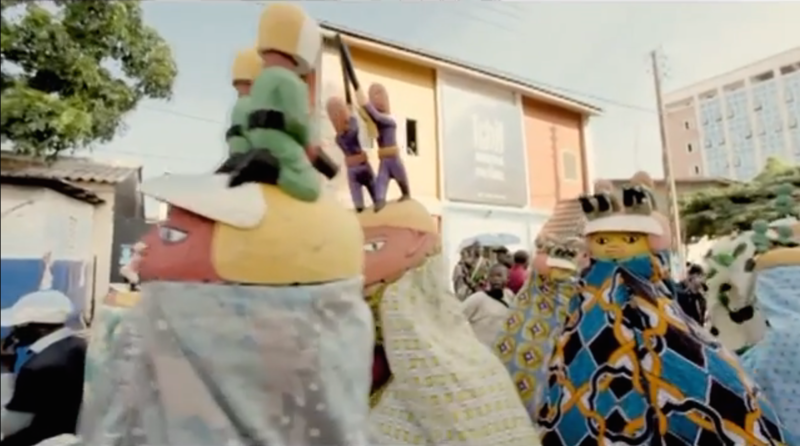 The Egun and the Zangbeto masks are Beninese and Nigerian versions of a Yoruba watchman mask who has a police function and reveres the spirit of the dead, while Gélédé honors mothers. In the meantime, Aplogan created various Legba statues in Plexiglas and string lights for Biennale Bénin 2012, a series of which was installed at Centre Kora, the main exhibition hall, and another one in a public space in Ouidah. Referring to the mask-monuments as pièces témoins(“ witness works” ), Aplogan explains that her primary intention is to render them visible (“ visualiser” ) and ordinary (“ rendre ordinaire” ) without assigning them a particular function. With regard to the Legba statues in particular, she says that she wants to replace the negative connotations of darkness and backwardness that colonial ideology assigned to these sculptures of mud hidden in Vodun temples with positive values of light and beauty, celebration and protection, with the use of Plexiglas and lights. In other words, Aplogan wants to bring people “ out of themselves” and “ out of the taboo” in which she thinks they are confined. Edwige Aplogan, Drapé de la Place de l’Étoile Rouge, 2010. 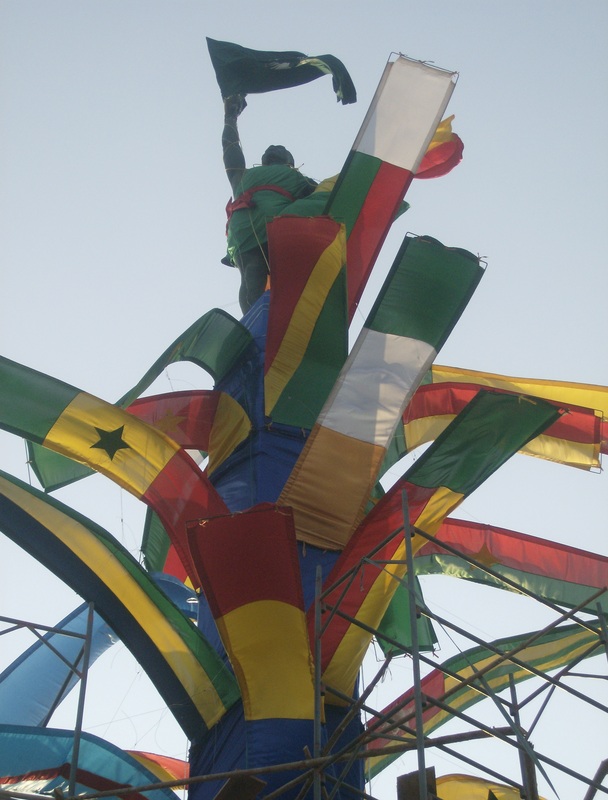 Satin flag wrapping of the Place de l’Étoile Rouge, Cotonou, Benin Republic. Courtesy the artist. But Aplogan’s rehabilitative intentions have been met with Vodun cult members’ protective stances and, at times, outward resistance. Prior to making her Egun mask-monument and her Legba sculpture, Aplogan went to the Vodun temples. There, she expressed her interest in representing a cult figure, secured authorization from cult members to do so and, in the case of the Egun mask-monument, worked with an artisan specialized in Egun mask-making to realize her oversized version of the mask. But after weeks of its successful exhibition, the Egun d’Adjarradoccodji disappeared. One of the Plexiglas Legba sculptures, first shown at the Fondation Zinsou and therefore “ protected,” that is, safely guarded by security personnel, did not. Other Plexiglas Legbas are safely preserved in the collection of the Museo Afro-Brasil in São Paolo. 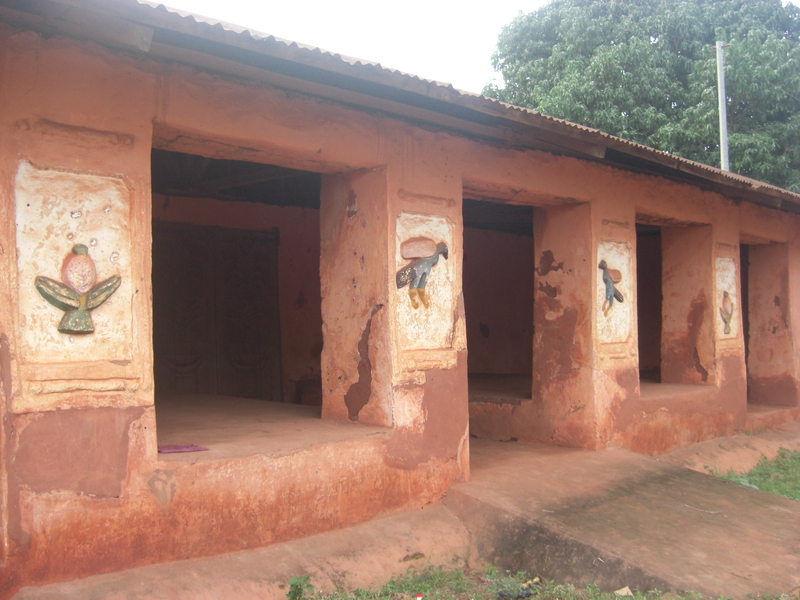 Aplogan fears that the Legba in Ouidah might also disappear during the biennial. But what to do? As Aplogan reminds us, the Legba is already a guardian figure. Wouldn’ t guarding a guardian be redundant? Aplogan, who is not a Vodun practitioner but respects the religion as an integral part of her Beninese identity, surmises that once faced with the power of representation of the Egun, the priests felt the need to, in her words, “ recuperate” it. She stops short of saying that they stole it. They didn’ t. They recovered what was theirs. This interpretation seems all the more valid that the Egun disappeared a week before the annual Vodun festival, which is usually held on January 10. For Aplogan, it is clear: “ Il ne pouvait pas y avoir le live et la statue” ; there couldn’ t be live Egunguns masqueraders and an Egungun statue occupying the same space at the same time, less they cancel out – or double up? – each other’s power in ways that could be detrimental, and even possibly fatal, to the cult and its practitioners. Inspired by the Fiftieth Anniversary of the Independences as well, Tchif (b. Francis Tchiakpe in 1973 in Cotonou) organized In-Dependence Day, a protest-performance with fifty Gélédé masks, fifty zemidjans, and fifty young women (“ parce que les femmes en Afrique représentent un signe de richesse” ; “ because women represent a sign of wealth in Africa” the artist explained), held on Boulevard Steinmetz and at Espace Tchif in downtown Cotonou on 1 August 2010.12 For In-Dependance Day, the “ Day of the Dependence,” a critique of the very idea of African independence, Tchif commissioned famed Covè mask-maker Eloi Lokossou to make Gélédé masks with twin gun-toting figures not unlike colonial-era representations of French military and police forces. Didier AwadiWoye music video in the midst of Tchif’s In-Dependance Dayprocessional performance, August 1, 2010. 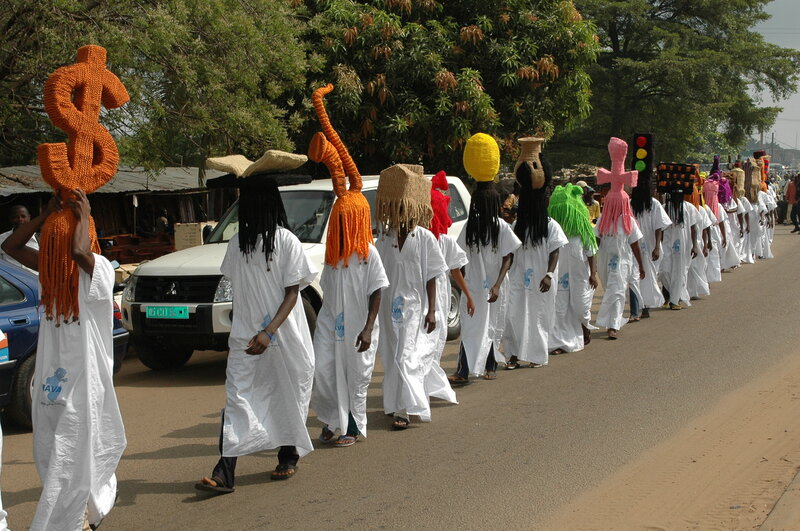 As a masquerade worn by men to honor the spirit of women and ensure maternal fertility and children’s health as part of wider philosophical principles of social harmony in formerly matriarchal societies, how could the masquerade, which usually occurs in the marketplace for up to a week, fare amidst zemidjans and female demonstrators on one of Cotonou’s main avenues over the course of a few hours? Did the motorization of the Gélédé masks on zemidjans, in the chaos of a city avenue, somehow disrupt their status as vehicles of social harmony? Did their mirroring in the urban-dwelling female protesters disarm their power of representation of traditional female values? Did the doubling of the male social commenter as female Gélédé character with the female protester figure disarm rather than reinforce the message of In-dependance Day? What is a contemporary Gélédé masquerade and was In-dependance Day one? Was In-dependance Day a contemporary art performance instead? Or was it both? Tchif, In-Dependance Day, August 1, 2010. Close up of the Gélédé-styled masks from Eloi Lokossou as part of the processional performance held on the anniversary of Benin Independence Day, Cotonou, Benin Republic. Didier Awadi, Woye, 2010. 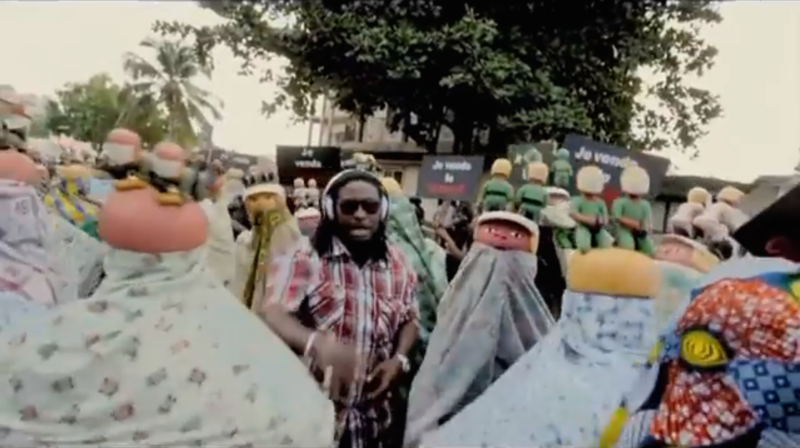 Film still from the music video. © Didier Awadi. Back in 2009, Tchif was already speaking about producing a contemporary Gélédé masquerade, which was to be commissioned by the Musée du Quai Branly in Paris. At the time, Tchif also spoke of what he referred to as “ la mascarade des revenants Klinto,” or “ the masquerade of the Klinto ghosts,” who would be dressed in cosmonaut suits as “ sculpture vivante,” or “ living sculpture,” and take his notion of contemporary masquerade up a notch. If this performance piece is to happen it might well reinvent the language of masquerade altogether, creating new masks in a resolutely contemporary vocabulary. Zinkpè (Dominique Zinkpè, b. in Cotonou in 1969) is no novice to working in the streets.14 A veteran of Boulev’ art (1999-2005), a recurring international open studio and outdoor exhibition project conceived to bring contemporary art closer to the public of Cotonou, Zinkpè is also the creator of Taxis-Zinkpè (2000-2011), a fleet of so-called taxi-brousses outfitted with additional cargo to emphasize the daily feats of fitness of mass public transportation in Africa. Zinkpè’s first dé ambulatoire as he calls it, Awobobo, its name derived from a Fon word expressing a feeling of surprise (the best English equivalent might be “ wow” ) was nothing short of wowing indeed. 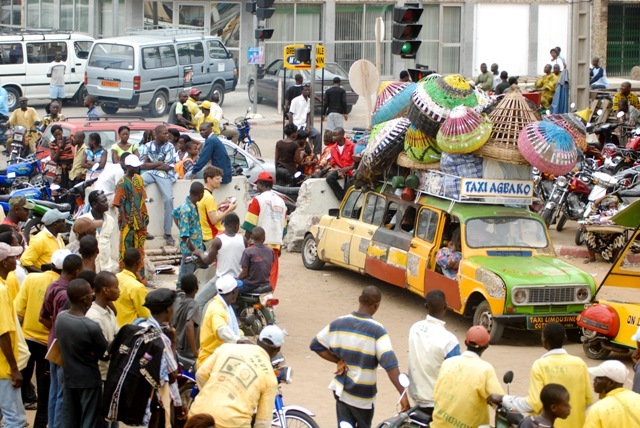 Produced for the 2008 FITHEB theater festival (Festival International de Théâtre du Bénin), the public processional performance spanned seven kilometers—from the FITHEB’s headquarters as the location of the former Ciné Vog movie theatre, to Station Lègba, Etoile Rouge, Cadjéhoun and Place du Souvenir— lasted over three hours, and featured hundred of participants who navigated pirogues, rode taxi-brousses and moto-taxis, marched and danced.15 Zinkpè himself led the procession along with dancers he had hired from the royal court of Porto-Novo (one of the three former Fon kingdom) while onlookers and passers-by followed behind. A part-time Abomey resident who traces his ancestry to the former Dahomey Kingdom, Zinkpè acknowledges living Fon traditions as Awobobo’ssource of inspiration. Dominique Zinkpè, Awobobo, March 24, 2010. Processional performance for the FITHEB theater festival, Cotonou, Benin Republic. Courtesy the artist. CultureFrom November 2012 to March 2013, a contemporary incarnation of what was once known to European travelers to Dahomey as Coutumes, or “ Customs,” will take place in Abomey, albeit reduced to what was once its culminating celebration, La Fête des Richesses du Roi (The Procession of the King’s Wealth).16 The Customs were religious celebrations of a military monarchywhose chief economic activity was the slave trade. Regular Customstook place annually while special Customs were held following a king’s funeral. The Customs developed in the eighteenth century and reached their apex in the mid-nineteenth century under father and son kings Ghezo and Glélé. The last Fête des Richesses took place over thirty years ago. 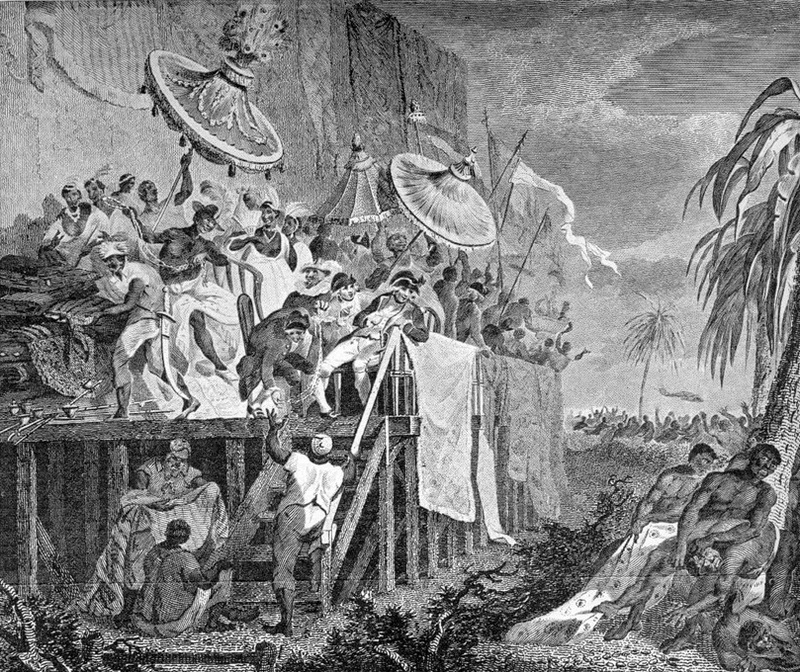 A parade of the royal possessions taken out of the King’s warehouses by armies of male and female government officials, religious leaders, soldiers, and slaves to be partly redistributed to his subjects, the Fête des Richesses was preceded by mass human sacrifices of slaves and war prisoners. Its content ranged from European gifts, local artifacts, Vodun ritual instruments, slaves and the kingdom’s subjects. Together, as the King’s most prized possessions, they served as the motor of Benin’s economic development. Most importantly, as concerns Beninese art and museum history, I would suggest that the Fête des Richesseswas nothing short of a living curiosity cabinet, a sort of processional proto-museum, a mode of display specific to the cultural circumstances of the times. Representation of the Dahomena Xwetanu, also known as Annual Customs or Fête des Richesses. From A.DALZEL, The History of Dahomey, an Inland Kingdom of Africa. London: T. Spilsbury and Son, 1793. The founder of Unik-Lieu de création contemporaine, a space for contemporary artistic creation in Abomey that includes artist studios, an outdoor concert venue, a library, a restaurant and a roof terrace, Zinkpè is at ease with tradition and modernity. He is also the new sponsor of the arts in Abomey, serving as the head of this artistic village on an enclosed compound that is not unlike the Dahomey palaces where craftsmen and their families are still seen perpetuating the trades of their ancestors who were the official court artists and artisans. Will Zinkpè, with his interest in the processional traditions of both the former Fon kingdoms andBenin’s contemporary activities of commerce, contribute further to the creation of new artistic traditions? Will he, along with Aplogan, Gaba, and Tchif, help write a new Beninese art history that encompasses its performance traditions while remaining mindful of its distinct display models? Masks Also Move strives to show the different paths through which Aplogan, Gaba, Tchif, and Zinkpè arrived at performance and/or the roads they traveled through new uses of masquerade. Needless to say, Mask Also Move does not seek to suggest that all Beninese – let alone all African contemporary performance art – stems from masquerade or processional traditions or any one particular tradition, phenomenon or source. Instead, it seeks to highlight the new public or performative usages the four aforementioned Beninese artists have made of these traditions. Masks Also Move also attempts to shed light on the problem and paradox inherent in the primitivist appropriation of masquerade and Eurocentric definitions of performance. By concentrating upon works that put masks back into light (Aplogan) or into motion (Gaba, Tchif, Zinkpè), Masks Also Move also indirectly challenges other works by contemporary African artists, including in Benin, who made and still make masks as museum objects as per the European convention rather than as performance material, as per the African one. The artists in Masks Also Move challenge these museum-centric conceptions of art and fully re-appropriate part of a heritage which, though still rejected by some, is increasingly understood as an asset in one of the most compelling contemporary artistic practices: performance. These artists do so often out of a stated desire to appeal to a wider audience, especially a local African one, at home in the cities where they reside and where museums, when they exist, are perceived as inaccessible to the majority of the population. These re-appropriations of performance practices also mean entering into the discourse of performance art in a way that shapes it according to genealogical lineages that counter the very misconceptions that might have impeded the development of contemporary performance practices in Africa in the first place. The penultimate sentences in Statues Also Die sound like an epitaph: masks which “ fight against death” and “ unveil that which it [death] seeks to hide” are said to “ die in turn, classified, labeled conserved in the ice of showcases and collections” and “ enter into the history of art, paradise of forms, where the most mysterious relationships are established.” African art has gone a long way since 1953 when it was seen as an appendage of European culture, even amongst its most vanguard supporters. How much further can contemporary African art go if its statues live again and its masks move once more? In short, if performance takes its rightful place back within African art? Masks Also Move: Case Studies for a Genealogy of Performance Art in Benin and Beyond, was commissioned for the catalogue of Biennale Bénin 2012 which was never published. This essay is the outcome of The Abomey Encounters, one of the research programs for the second and last edition of Biennale Bénin of which I was an Associate Curator for Research. The program consisted in a 90-minute discussion around the works of Aplogan, Gaba, Tchif and Zinkpè with Romuald Tchibozo, Professor of Art History, University of Abomey-Calavi and Joseph Adandé, also Professor of Art History, University of Abomey. It took place at Unik-Lieu de Création Contemporaine. Throughout this essay the word mask is used in its full acceptation, as the full apparatus, including the garb disguising the body, as performed in masquerades, understood as a festival of masks, rather than as the object typically collected by museums, which is worn on the head or covers the face. Similarly, the expression performance art is used as per its accepted usage as the multidisciplinary practice of mostly contemporary visual artists. Only a more in-depth study of the relationship between masquerade and performance could endeavor to re-define these terms and analyze anew their attendant practices. See Joseph Adandé's research project summary on appliqué cloth at Institut National d’ Histoire de l’ Art (INHA): http://www.inha.fr/spip.php?article4033. See: RoseLee Goldberg, Performance Art. From Futurism to the Present (New York: H.N. Abrams) 1979. Republished as Performance Art in 1988 and expanded in 2001, published by Thames and Hudson (London) with a third edition released in 2011. See Goldberg, Performance Art (2001), back cover. Okwui Enwezor and Chika Okeke-Agulu, Contemporary African Art since 1980, (Bologna: Damiani, 2009). Since writing this essay, Enwezor has taken a strong stance vis-à-vis performance, most notably in the performance programmed at the Arena as part of All the World’s Futures, the 56thVenice Biennale (2015) of which he is the artistic director. Designed by David Adjaye, also the scenographer of the Arsenale, the Arena functions as the beating heart of the International Pavilion, showcasing performances throughout the run of the Biennial. In a New Orleans – Cotonou Skype phone conversation with the author, October 4, 2012. Information in this section are from an 80-minute interview done by the author with the artist at her home in Le Carrefour des Trois Bornes in Cotonou on August 8, 2012 and from subsequent email conversations in early October 2012. Art historian Joseph Adandé thinks as much. In an interview with the author at the École nationale du patrimoine in Porto-Novo on 9 August 2012, Adandé said that he thought that it was from the concept of désacralisation or “ desacralization” that the concept of performance art in contemporary African art could be traced. Information in this section comes from notes from a long discussion between the artist and the author in Cotonou on 10 August 2009 and on 8 August 2012. The 2009 discussion began at Espace Tchif, continued at Restaurant Le Laurier, and concluded by the seaside. The 2012 interview took place on August 8, 2012 at the artist's studio at the El Dorado beach resort near Cotonou and lasted thirty minutes. See http://youtu.be/N20y1Ytq2EI. Songs in Didier Awadi's Présidents d’Afrique are each dedicated to a different African historical figure. Woye is dedicated to former Burkina Faso President Thomas Sankara. Information from this section come from notes from a visit to Zinkpè at his home and studio in Cotonou on 11 August 2009, from an hour-long interview with Anne Szefer Karlsen at Unik in Abomey on 7 August 2012, and from a fifteen minute Skype phone call to Cotonou on 30 September 2012.